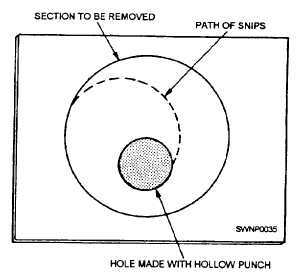 Figure 2-16.Proper method of cutting with snips. 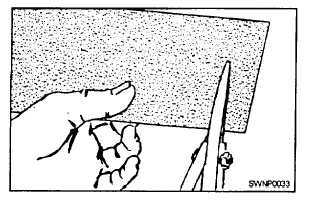 Home > Construction Training Manuals > Steelworker Volume 02 > Figure 2-16.Proper Method Of Cutting With Snips. Figure 2-16. - Proper method of cutting with snips. edge will result. Cut circular sections from the right side (fig. 2-17). 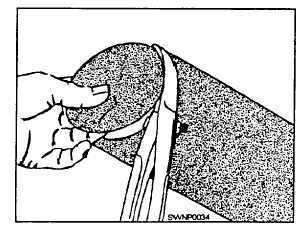 When making internal circular cuts, you make a small opening near the center of the opening, insert the snips, and cut from the upper side, gradually increasing the radius of the cut until the opening is completed (fig. 2-18). Large sheet-metal sections are cut on SQUARING SHEARS that are discussed later in this chapter. 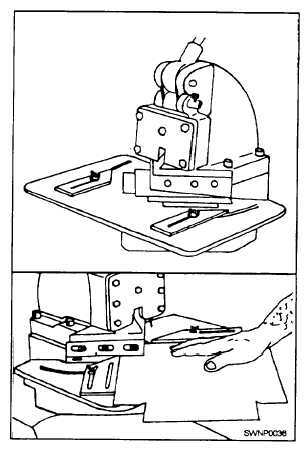 The COMBINATION NOTCHER, COPER, and SHEAR (fig. 2-19) is ideal for notching corners or the edge of sheet metal. The blades are adjustable for conventional notching or for piercing, starting inside the blank. PORTABLE POWER SHEARS make it possible to do production work. They are designed to do straight or circular cutting (fig. 2-20). Figure 2-17. - Making a circular cut. Figure 2-18. - Making an internal circular cut. Figure 2-19. - Combination notcher, coper, and shear.